Two longtime vacant Downtown Marion buildings were purchased this year by a prominent local architecture firm shaking things up to redevelop and revitalize Downtown Marion. Announced this week, Halstead Architects purchased the historic Marion National Bank Building, the tallest building in Downtown (at 402 S. Washington), from its private owner in California. The entire building had sat vacant and deteriorating after the former owner’s remaining tenant, Regions Bank, finally terminated its lease over 3 years ago. Today, the building’s fate is in the hands of new owner Michael Halstead, owner & founder of Halstead Architects, who has plans for a mixed-use development (residential & commercial) in the 7-story building. Now with the key, Halstead is taking swift action to stabilize the building. Mayor Jess Alumbaugh had encouraged Halstead to buy the building after learning its sale price was drastically reduced. Alumbaugh said he’s very excited that the building, which was recently named Indiana Landmarks’ Top 10 Most Endangered Buildings, is now in the arms of a proven local developer. Early this year, Halstead also purchased the historic Marks Building from the City, which most recently housed Beatniks that had closed years ago. Halstead has been restoring the building (at 123 E. 3rd St.), and is nearly finished prepping the main floor in search for a business tenant. Partner, Michelle Doyle, said they are nearly finished preparing the “white box” (move-in ready) 3,000 sq. ft. space, which has courtyard access suitable for outdoor dining and special events nestled Downtown. She said they hope a restaurant or brewery leases the space for best use. This month, Halstead officially set up shop on the 2nd floor after completing renovation. They also created and have already leased out a one-bedroom market-rate apartment behind their office. 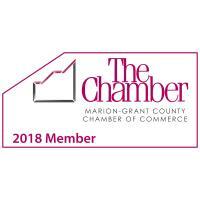 The firm is having a ribbon-cutting for their new space through the Chamber of Commerce on Wednesday, August 22nd, at 1pm. The public is invited. There is undeniable transformation happening Downtown with several other buildings exchanging hands and undergoing redevelopment. Also announced this week was the purchase of the Old National Bank Building by local businessman, Bill Reece, for multi-use including yoga & healthcare, a café, and leasable upstairs offices. In recent months, Marion Housing Authority has been making a footprint downtown with three big purchases including the former Hotel Marion, Centrum Mall, and the Sophia Salin Building on the Square. Additionally, three local entrepreneurs recently bought a building from the City and have started repurposing an old attorney’s office, after it too, sat vacant for many years.